These highlights do not include all the information needed to use GEMCITABINE FOR INJECTION safely and effectively. See full prescribing information for GEMCITABINE FOR INJECTION. Gemcitabine for Injection is for intravenous use only. To report SUSPECTED ADVERSE REACTIONS, contact Accord Healthcare Inc. at 1-866-941-7875 or FDA at 1-800-FDA-1088 or www.fda.gov/medwatch. Gemcitabine for Injection in combination with carboplatin is indicated for the treatment of patients with advanced ovarian cancer that has relapsed at least 6 months after completion of platinum-based therapy. Gemcitabine for Injection in combination with paclitaxel is indicated for the first-line treatment of patients with metastatic breast cancer after failure of prior anthracycline-containing adjuvant chemotherapy, unless anthracyclines were clinically contraindicated. Gemcitabine for Injection is indicated in combination with cisplatin for the first-line treatment of patients with inoperable, locally advanced (Stage IIIA or IIIB), or metastatic (Stage IV) non-small cell lung cancer. Gemcitabine for Injection is indicated as first-line treatment for patients with locally advanced (nonresectable Stage II or Stage III) or metastatic (Stage IV) adenocarcinoma of the pancreas. Gemcitabine for Injection is indicated for patients previously treated with 5-FU. The recommended dose of Gemcitabine for Injection is 1000 mg/m 2 as an intravenous infusion over 30 minutes on Days 1 and 8 of each 21-day cycle, in combination with carboplatin AUC 4 intravenously after Gemcitabine for Injection administration on Day 1 of each 21-day cycle. Refer to carboplatin prescribing information for additional information. Recommended Gemcitabine for Injection dose modifications for myelosuppression are described in Table 1 and Table 2 [see Warnings and Precautions ( 5.2)]. Refer to Dosage and Administration ( 2.5) for recommendations for non-hematologic adverse reactions. The recommended dose of Gemcitabine for Injection is 1250 mg/m 2 intravenously over 30 minutes on Days 1 and 8 of each 21-day cycle that includes paclitaxel. Paclitaxel should be administered at 175 mg/m 2 on Day 1 as a 3 hour intravenous infusion before Gemcitabine for Injection administration. Recommended dose modifications for Gemcitabine for Injection for myelosuppression are described in Table 3 [ see Warnings and Precautions ( 5.2) ]. Refer to Dosage and Administration ( 2.5) for recommendations for non-hematologic adverse reactions. The recommended dose of Gemcitabine for Injection is 1250 mg/m 2 intravenously over 30 minutes on Days 1 and 8 in combination with cisplatin therapy. Administer cisplatin intravenously at 100 mg/m 2 on Day 1 after the infusion of Gemcitabine for Injection. Recommended dose modifications for Gemcitabine for Injection myelosuppression are described in Table 4 [ [see Warnings and Precautions ( 5.2)]. Refer to Dosage and Administration ( 2.5) for Gemcitabine for Injection recommendations for non-hematologic adverse reactions. Weeks 1-8: weekly dosing for the first 7 weeks followed by one week rest. After week 8: weekly dosing on Days 1, 8, and 15 of 28-day cycles. Recommended dose modifications for Gemcitabine for Injection for myelosuppression are described in Table 4 [see Warnings and Precautions ( 5.2)]. Refer to Dosage and Administration ( 2.5) for recommendations for non-hematologic adverse reactions. Patients receiving Gemcitabine for Injection should be monitored prior to each dose with a complete blood count (CBC), including differential and platelet count. If marrow suppression is detected, therapy should be modified or suspended according to the guidelines in Table 4. Withhold Gemcitabine for Injection or reduce dose by 50% for other severe (Grade 3 or 4) non-hematological toxicity until resolved. No dose modifications are recommended for alopecia, nausea, or vomiting. Reconstitute the vials with 0.9% Sodium Chloride Injection without preservatives. Add 5 mL to the 200-mg vial or 25 mL to the 1-g vial or 50 mL to the 2-g vial. These dilutions each yield a Gemcitabine for Injection concentration of 38 mg/mL. Complete withdrawal of the vial contents will provide 200 mg, 1 g or 2 g of Gemcitabine for Injection. Prior to administration the appropriate amount of drug must be diluted with 0.9% Sodium Chloride Injection. Final concentrations may be as low as 0.1 mg/mL. Reconstituted Gemcitabine for Injection is a clear, colorless to light straw-colored solution. Inspect visually prior to administration and discard for particulate matter or discoloration. Gemcitabine for Injection solutions are stable for 24 hours at controlled room temperature of 20° to 25°C (68° to 77°F). Do not refrigerate as crystallization can occur. 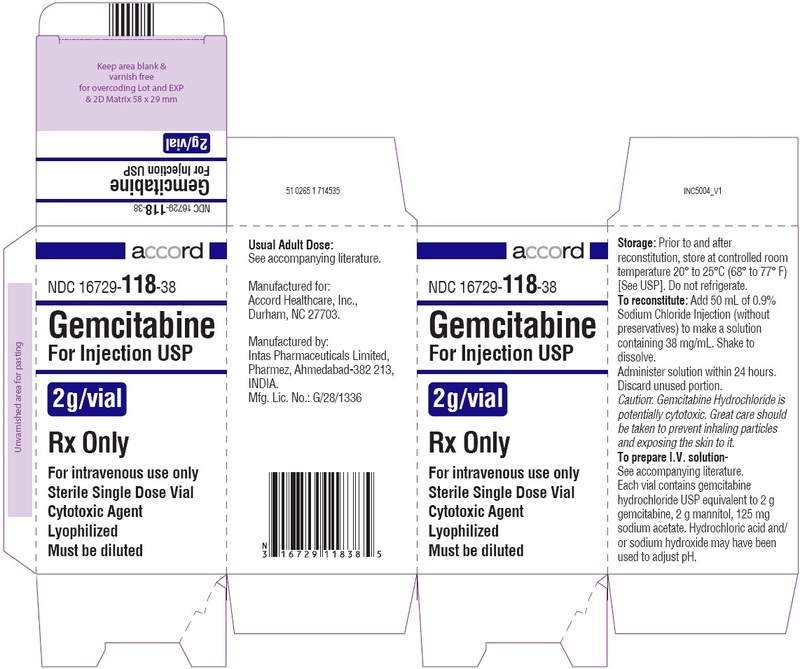 Gemcitabine for Injection USP is a white to off-white lyophilized powder available in sterile single-dose vials containing 200 mg, 1 g or 2 g gemcitabine. Gemcitabine for Injection is contraindicated in patients with a known hypersensitivity to gemcitabine. In clinical trials evaluating the maximum tolerated dose of Gemcitabine for Injection, prolongation of the infusion time beyond 60 minutes or more frequent than weekly dosing resulted in an increased incidence of clinically significant hypotension, severe flu-like symptoms, myelosuppression, and asthenia. The half-life of Gemcitabine for Injection is influenced by the length of the infusion [see Clinical Pharmacology ( 12.3)] . Myelosuppression manifested by neutropenia, thrombocytopenia, and anemia occurs with Gemcitabine for Injection as a single agent and the risks are increased when Gemcitabine for Injection is combined with other cytotoxic drugs. In clinical trials, Grade 3-4 neutropenia, anemia, and thrombocytopenia occurred in 25%, 8%, and 5%, respectively of patients receiving single-agent Gemcitabine for Injection. The frequencies of Grade 3-4 neutropenia, anemia, and thrombocytopenia varied from 48% to 71%, 8 to 28%, and 5 to 55%, respectively, in patients receiving Gemcitabine for Injection in combination with another drug. Pulmonary toxicity, including interstitial pneumonitis, pulmonary fibrosis, pulmonary edema, and adult respiratory distress syndrome (ARDS), has been reported. In some cases, these pulmonary events can lead to fatal respiratory failure despite discontinuation of therapy. The onset of pulmonary symptoms may occur up to 2 weeks after the last dose of Gemcitabine for Injection. Discontinue Gemcitabine for Injection in patients who develop unexplained dyspnea, with or without bronchospasm, or have any evidence of pulmonary toxicity [see Adverse Reactions ( 6.1 and 6.2)] . Hemolytic uremic syndrome, including fatalities from renal failure or the requirement for dialysis can occur in patients treated with Gemcitabine for Injection. In clinical trials, HUS was reported in 6 of 2429 patients (0.25%). Most fatal cases of renal failure were due to HUS [see Adverse Reactions ( 6.1 and 6.2)] . Assess renal function prior to initiation of Gemcitabine for Injection and periodically during treatment. Consider the diagnosis of HUS in patients who develops anemia with evidence of microangiopathic hemolysis, elevation of bilirubin or LDH, or reticulocytosis; severe thrombocytopenia; or evidence of renal failure (elevation of serum creatinine or BUN) [see Dosage and Administration ( 2.5) and Use in Specific Populations ( 8.6)] . Permanently discontinue Gemcitabine for Injection in patients with HUS or severe renal impairment. Renal failure may not be reversible even with discontinuation of therapy. Drug-induced liver injury, including liver failure and death, has been reported in patients receiving Gemcitabine for Injection alone or in combination with other potentially hepatotoxic drugs [see Adverse Reactions ( 6.1 and 6.2)] . Administration of Gemcitabine for Injection in patients with concurrent liver metastases or a pre-existing medical history or hepatitis, alcoholism, or liver cirrhosis can lead to exacerbation of the underlying hepatic insufficiency [see Use in Specific Populations ( 8.7)] . Assess hepatic function prior to initiation of Gemcitabine for Injection and periodically during treatment. Discontinue Gemcitabine for Injection in patients that develop severe liver injury. Gemcitabine for Injection is not indicated for use in combination with radiation therapy. Concurrent (given together or â‰¤7 days apart) â€” Life-threatening mucositis, especially esophagitis and pneumonitis occurred in a trial in which Gemcitabine for Injection was administered at a dose of 1000 mg/m 2 to patients with non-small cell lung cancer for up to 6 consecutive weeks concurrently with thoracic radiation. Non-concurrent (given >7 days apart) â€” Excessive toxicity has not been observed when Gemcitabine for Injection is administered more than 7 days before or after radiation. Radiation recall has been reported in patients who receive Gemcitabine for Injection after prior radiation. Capillary leak syndrome (CLS) with severe consequences has been reported in patients receiving Gemcitabine for Injection as a single agent or in combination with other chemotherapeutic agents. Discontinue Gemcitabine for Injection if CLS develops during therapy. Posterior reversible encephalopathy syndrome (PRES) has been reported in patients receiving Gemcitabine for Injection as a single agent or in combination with other chemotherapeutic agents. PRES can present with headache, seizure, lethargy, hypertension, confusion, blindness, and other visual and neurologic disturbances. Confirm the diagnosis of PRES with magnetic resonance imaging (MRI) and discontinue Gemcitabine for Injection if PRES develops during therapy. The data described below reflect exposure to Gemcitabine for Injection as a single agent administered at doses between 800 mg/m 2 to 1250 mg/m 2 over 30 minutes intravenously, once weekly, in 979 patients with a variety of malignancies. The most common (â‰¥20%) adverse reactions of single-agent Gemcitabine for Injection are nausea/vomiting, anemia, increased ALT, increased AST, neutropenia, increased alkaline phosphatase, proteinuria, fever, hematuria, rash, thrombocytopenia, dyspnea, and edema. The most common (â‰¥5%) Grade 3 or 4 adverse reactions were neutropenia, nausea/vomiting; increased ALT, increase alkaline phosphatase, anemia, increased AST, and thrombocytopenia. Approximately 10% of the 979 patients discontinued Gemcitabine for Injection due to adverse reactions. Adverse reactions resulting in discontinuation of Gemcitabine for Injection in 2% of 979 patients were cardiovascular adverse events (myocardial infarction, cerebrovascular accident, arrhythmia, and hypertension) and adverse reactions resulting in discontinuation of Gemcitabine for Injection in less than 1% of the 979 patients were anemia, thrombocytopenia, hepatic dysfunction, renal dysfunction, nausea/vomiting, fever, rash, dyspnea, hemorrhage, infection, stomatitis, somnolence, flu-like syndrome, and edema. Table 5 presents the incidence of adverse reactions reported in 979 patients with various malignancies receiving single-agent Gemcitabine for Injection across 5 clinical trials. Table 5 includes all clinical adverse reactions, reported in at least 10% of patients. A listing of clinically significant adverse reactions is provided following the table. a Grade based on criteria from the World Health Organization (WHO). b N=699-974; all patients with laboratory or non-laboratory data. d For approximately 60% of patients, non-laboratory adverse events were graded only if assessed to be possibly drug-related. Fever - Fever occurred in the absence of clinical infection and frequently in combination with other flu-like symptoms. Pulmonary - Dyspnea unrelated to underlying disease and sometimes accompanied by bronchospasm. Edema - Edema (13%), peripheral edema (20%), and generalized edema (<1%); <1% of patients discontinued Gemcitabine for Injection due to edema. Allergic -Bronchospasm (<2%); anaphylactoid reactions [see Contraindications ( 4)] . Table 6 presents the incidence of selected adverse reactions, occurring in â‰¥10% of Gemcitabine for Injection-treated patients and at a higher incidence in the Gemcitabine for Injection plus cisplatin arm, reported in a randomized trial of Gemcitabine for Injection plus cisplatin (n=262) administered in 28-day cycles as compared to cisplatin alone (n=260) in patients receiving first-line treatment for locally advanced or metastatic non-small cell lung cancer (NSCLC) [see Clinical Studies ( 14.3)] . Patients randomized to Gemcitabine for Injection plus cisplatin received a median of 4 cycles of treatment and those randomized to cisplatin received a median of 2 cycles of treatment. In this trial, the requirement for dose adjustments (>90% versus 16%), discontinuation of treatment for adverse reactions (15% versus 8%), and the proportion of patients hospitalized (36% versus 23%) were all higher for patients receiving Gemcitabine for Injection plus cisplatin arm compared to those receiving cisplatin alone. The incidence of febrile neutropenia (9/262 versus 2/260), sepsis (4% versus 1%), Grade 3 cardiac dysrhythmias (3% versus <1%) were all higher in the Gemcitabine for Injection plus cisplatin arm compared to the cisplatin alone arm. The two-drug combination was more myelosuppressive with 4 (1.5%) possibly treatment-related deaths, including 3 resulting from myelosuppression with infection and one case of renal failure associated with pancytopenia and infection. No deaths due to treatment were reported on the cisplatin arm. a National Cancer Institute Common Toxicity Criteria (CTC) for severity grading. b N=217-253; all Gemcitabine plus cisplatin patients with laboratory or non-laboratory data Gemcitabine for Injection at 1000 mg/m 2 on Days 1, 8, and 15 and cisplatin at 100 mg/m 2 on Day 1 every 28 days. 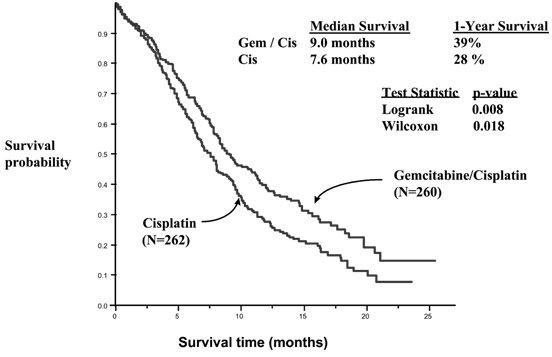 c N=213-248; all cisplatin patients with laboratory or non-laboratory data. Cisplatin at 100 mg/m 2 on Day 1 every 28 days. e Percent of patients receiving transfusions. Percent transfusions are not CTC-graded events. f Non-laboratory events were graded only if assessed to be possibly drug-related. Table 7 presents the incidence of selected adverse reactions, occurring in â‰¥10% of Gemcitabine for Injection-treated patients and at a higher incidence in the Gemcitabine for Injection plus cisplatin arm, reported in a randomized trial of Gemcitabine for Injection plus cisplatin (n=69) administered in 21-day cycles as compared to etoposide plus cisplatin alone (n=66) in patients receiving first-line treatment for locally advanced or metastatic non-small cell lung cancer (NSCLC) [see Clinical Studies ( 14.3)] . A listing of clinically significant adverse reactions is provided following the table. Patients in the Gemcitabine for Injection/cisplatin (GC) arm received a median of 5 cycles and those in the etoposide/cisplatin (EC) arm received a median of 4 cycles. The majority of patients receiving more than one cycle of treatment required dose adjustments; 81% in the (GC) arm and 68% in the (EC) arm. The incidence of hospitalizations for treatment-related adverse events was 22% (GC) and 27% in the (EC) arm. The proportion of discontinuation of treatment for treatment-related adverse reactions was higher for patients in the (GC) arm (14% versus 8%). The proportion of patients hospitalized for febrile neutropenia was lower in the (GC) arm (7% versus 12%). There was one death attributed to treatment, a patient with febrile neutropenia and renal failure, which occurred in the Gemcitabine for Injection/cisplatin arm. b N=67-69; all Gemcitabine plus cisplatin patients with laboratory or non-laboratory data. Gemcitabine at 1250 mg/m 2 on Days 1 and 8 and cisplatin at 100 mg/m 2 on Day 1 every 21 days. c N=57-63; all cisplatin plus etoposide patients with laboratory or non-laboratory data. Cisplatin at 100 mg/m 2 on Day 1 and intravenous etoposide at 100 mg/m 2 on Days 1, 2, and 3 every 21 days. e WHO grading scale not applicable to proportion of patients with transfusions. f Non-laboratory events were graded only if assessed to be possibly drug-related. Pain data were not collected. g Flu-like syndrome and edema were not graded. Table 8 presents the incidence of selected adverse reactions, occurring in â‰¥10% of Gemcitabine for Injection-treated patients and at a higher incidence in the Gemcitabine for Injection plus paclitaxel arm, reported in a randomized trial of Gemcitabine for Injection plus paclitaxel (n=262) compared to paclitaxel alone (n=259) for the first-line treatment of metastatic breast cancer (MBC) in women who received anthracycline-containing chemotherapy in the adjuvant/neo-adjuvant setting or for whom anthracyclines were contraindicated. [see Clinical Studies ( 14.2)] . The requirement for dose reduction of paclitaxel were higher for patients in the Gemcitabine for Injection/paclitaxel arm (5% versus 2%). The number of paclitaxel doses omitted (<1%), the proportion of patients discontinuing treatment for treatment-related adverse reactions (7% versus 5%), and the number of treatment-related deaths (1 patient in each arm) were similar between the two arms. a Severity grade based on National Cancer Institute Common Toxicity Criteria (CTC) Version 2.0.
c Non-laboratory events were graded only if assessed to be possibly drug-related. Clinically relevant Grade 3 or 4 dyspnea occurred with a higher incidence in the Gemcitabine plus paclitaxel arm compared with the paclitaxel arm (1.9% versus 0). Table 9 presents the incidence of selected adverse reactions, occurring in â‰¥10% of gemcitabine-treated patients and at a higher incidence in the Gemcitabine for Injection plus carboplatin arm, reported in a randomized trial of Gemcitabine for Injection plus carboplatin (n=175) compared to carboplatin alone (n=174) for the second-line treatment of ovarian cancer in women with disease that had relapsed more than 6 months following first-line platinum-based chemotherapy. [see Clinical Studies ( 14.1)] . Additional clinically significant adverse reactions, occurring in less than 10% of patients, are provided following Table 9. The proportion of patients with dose adjustments for carboplatin (1.8% versus 3.8%), doses of carboplatin omitted (0.2% versus 0), and discontinuing treatment for treatment-related adverse reactions (10.9% versus 9.8%), were similar between arms. Dose adjustment for Gemcitabine for Injection occurred in 10.4% of patients and Gemcitabine for Injection dose was omitted in 13.7% of patients in the Gemcitabine for Injection /carboplatin arm. a Grade based on Common Toxicity Criteria (CTC) Version 2.0.
c Percent of patients receiving transfusions. Transfusions are not CTC-graded events. Blood transfusions included both packed red blood cells and whole blood. Hematopoietic growth factors were administered more frequently in the Gemcitabine for Injection-containing arm: granulocyte growth factors (23.6% and 10.1%) and erythropoietic agents (7.3% and 3.9%). The following clinically relevant, Grade 3 and 4 adverse reactions occurred more frequently in the Gemcitabine for Injection plus carboplatin arm: dyspnea (3.4% versus 2.9%), febrile neutropenia (1.1% versus 0), hemorrhagic event (2.3% versus 1.1 %), motor neuropathy (1.1% versus 0.6%), and rash/desquamation (0.6% versus 0). Cardiovascular â€” Congestive heart failure, myocardial infarction, arrhythmias, supraventricular arrhythmias. Gemcitabine for Injection can cause fetal harm when administered to a pregnant woman. Based on its mechanism of action, Gemcitabine for Injection is expected to result in adverse reproductive effects. Gemcitabine was teratogenic, embryotoxic, and fetotoxic in mice and rabbits. If Gemcitabine for Injection is used during pregnancy, or if the patient becomes pregnant while taking Gemcitabine for Injection, the patient should be apprised of the potential hazard to a fetus. Gemcitabine is embryotoxic causing fetal malformations (cleft palate, incomplete ossification) at doses of 1.5 mg/kg/day in mice (approximately 0.005 times the recommended human dose on a mg/m 2 basis). 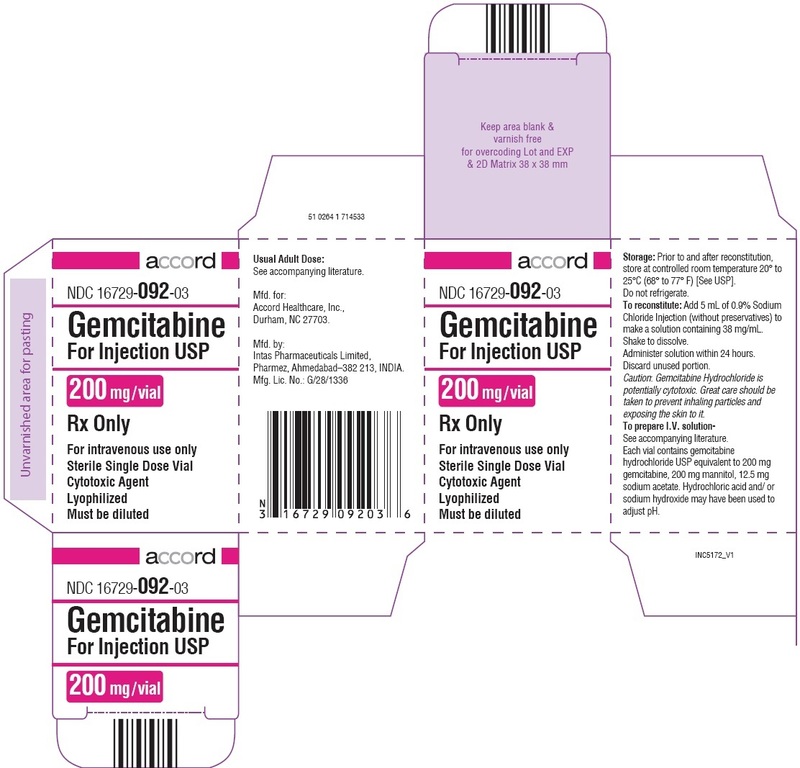 Gemcitabine is fetotoxic causing fetal malformations (fused pulmonary artery, absence of gall bladder) at doses of 0.1 mg/kg/day in rabbits (about 0.002 times the recommended human dose on a mg/m 2 basis). Embryotoxicity was characterized by decreased fetal viability, reduced live litter sizes, and developmental delays. [See Warnings and Precautions ( 5.6)]. It is not known whether this drug is excreted in human milk. Because many drugs are excreted in human milk and because of the potential for serious adverse reactions in nursing infants from Gemcitabine for Injection, a decision should be made whether to discontinue nursing or to discontinue the drug, taking into account the importance of the drug to the mother. The safety and effectiveness of Gemcitabine for Injection have not been established in pediatric patients. The safety and pharmacokinetics of gemcitabine were evaluated in a trial in pediatric patients with refractory leukemia. The maximum tolerated dose was 10 mg/m2/min for 360 minutes weekly for three weeks followed by a one-week rest period. The safety and activity of Gemcitabine for Injection were evaluated in a trial of pediatric patients with relapsed acute lymphoblastic leukemia (22 patients) and acute myelogenous leukemia (10 patients) at a dose of 10 mg/m2/min administered over 360 minutes weekly for three weeks followed by a one-week rest period. Patients with M1 or M2 bone marrow on Day 28 who did not experience unacceptable toxicity were eligible to receive a maximum of one additional four-week course. Toxicities observed included bone marrow suppression, febrile neutropenia, elevation of serum transaminases, nausea, and rash/desquamation. No meaningful clinical activity was observed in this trial. In clinical studies of Gemcitabine for Injection, enrolling 979 patients with various cancers who received Gemcitabine for Injection as a single agent, no overall differences in safety were observed between patients aged 65 and older and younger patients, with the exception of a higher rate of Grade 3-4 thrombocytopenia in older patients as compared to younger patients. In a randomized trial in women with ovarian cancer, 175 women received Gemcitabine for Injection plus carboplatin, of which 29% were age 65 years or older. Similar effectiveness was observed between older and younger women. There was significantly higher Grade 3/4 neutropenia in women 65 years of age or older. Gemcitabine for Injection clearance is affected by age, however there are no recommended dose adjustments based on patients' age [see Clinical Pharmacology ( 12.3)]. Gemcitabine for Injection clearance is affected by gender [see Clinical Pharmacology ( 12.3)] . In single-agent studies of Gemcitabine for Injection, women, especially older women, were more likely not to proceed to a subsequent cycle and to experience Grade 3/4 neutropenia and thrombocytopenia. Myelosuppression, paresthesias, and severe rash were the principal toxicities seen when a single dose as high as 5700 mg/m 2 was administered by intravenous infusion over 30 minutes every 2 weeks to several patients in a dose-escalation study. Gemcitabine for injection, USP is a nucleoside metabolic inhibitor that exhibits antitumor activity. Gemcitabine HCl is 2â€™-deoxy-2â€™,2â€™-difluorocytidine monohydrochloride (Î²-isomer). The empirical formula for gemcitabine HCl is C 9H 11F 2N 3O 4 HCl. It has a molecular weight of 299.66. Gemcitabine HCl is soluble in water, slightly soluble in methanol, and practically insoluble in ethanol and polar organic solvents. Gemcitabine for Injection is supplied in a sterile form for intravenous use only. Vials of Gemcitabine for Injection contain either 200 mg, 1 g or 2 g of gemcitabine HCl (expressed as free base) formulated with mannitol (200 mg, 1 g or 2 g, respectively) and sodium acetate (12.5 mg, 62.5 mg or 125 mg, respectively) as a sterile lyophilized powder. Hydrochloric acid and/or sodium hydroxide may have been added for pH adjustment. Gemcitabine kills cells undergoing DNA synthesis and blocks the progression of cells through the G1/S-phase boundary. 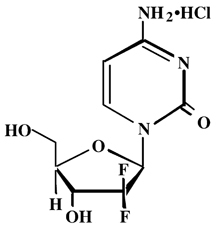 Gemcitabine is metabolized by nucleoside kinases to diphosphate (dFdCDP) and triphosphate (dFdCTP) nucleosides. Gemcitabine diphosphate inhibits ribonucleotide reductase, an enzyme responsible for catalyzing the reactions that generate deoxynucleoside triphosphates for DNA synthesis, resulting in reductions in deoxynucleotide concentrations, including dCTP. Gemcitabine triphosphate competes with dCTP for incorporation into DNA. The reduction in the intracellular concentration of dCTP by the action of the diphosphate enhances the incorporation of gemcitabine triphosphate into DNA (self-potentiation). After the gemcitabine nucleotide is incorporated into DNA, only one additional nucleotide is added to the growing DNA strands, which eventually results in the initiation of apoptotic cell death. The volume of distribution was increased with infusion length. Volume of distribution of gemcitabine was 50 L/m 2 following infusions lasting <70 minutes. For long infusions, the volume of distribution rose to 370 L/m 2. Gemcitabine pharmacokinetics are linear and are described by a 2-compartment model. Population pharmacokinetic analyses of combined single and multiple dose studies showed that the volume of distribution of gemcitabine was significantly influenced by duration of infusion and gender. Gemcitabine plasma protein binding is negligible. Gemcitabine disposition was studied in 5 patients who received a single 1000 mg/m 2/30 minute infusion of radiolabeled drug. Within one (1) week, 92% to 98% of the dose was recovered, almost entirely in the urine. Gemcitabine (<10%) and the inactive uracil metabolite, 2â€™-deoxy-2â€™,2â€™-difluorouridine (dFdU), accounted for 99% of the excreted dose. The metabolite dFdU is also found in plasma. The active metabolite, gemcitabine triphosphate, can be extracted from peripheral blood mononuclear cells. The half-life of the terminal phase for gemcitabine triphosphate from mononuclear cells ranges from 1.7 to 19.4 hours. Clearance of gemcitabine was affected by age and gender. The lower clearance in women and the elderly results in higher concentrations of gemcitabine for any given dose. Differences in either clearance or volume of distribution based on patient characteristics or the duration of infusion result in changes in half-life and plasma concentrations. Table 10 shows plasma clearance and half-life of gemcitabine following short infusions for typical patients by age and gender. a Half-life for patients receiving <70 minute infusion. Gemcitabine half-life for short infusions ranged from 42 to 94 minutes, and the value for long infusions varied from 245 to 638 minutes, depending on age and gender, reflecting a greatly increased volume of distribution with longer infusions. When Gemcitabine for Injection (1250 mg/m 2 on Days 1 and 8) and cisplatin (75 mg/m 2 on Day 1) were administered in NSCLC patients, the clearance of gemcitabine on Day 1 was 128 L/hr/m 2 and on Day 8 was 107 L/hr/m 2. 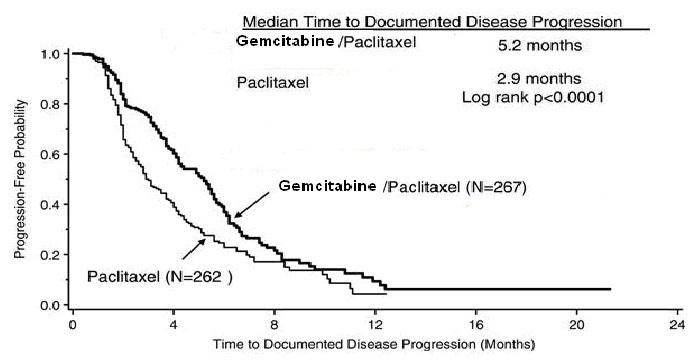 Analysis of data from metastatic breast cancer patients shows that, on average, Gemcitabine for Injection has little or no effect on the pharmacokinetics (clearance and half-life) of paclitaxel and paclitaxel has little or no effect on the pharmacokinetics of gemcitabine. 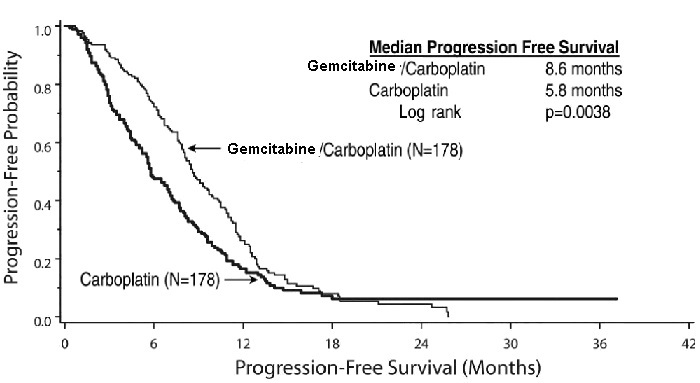 Data from NSCLC patients demonstrate that Gemcitabine for Injection and carboplatin given in combination does not alter the pharmacokinetics of gemcitabine or carboplatin compared to administration of either single agent. However, due to wide confidence intervals and small sample size, interpatient variability may be observed. Long-term animal studies to evaluate the carcinogenic potential of Gemcitabine for Injection have not been conducted. Gemcitabine was mutagenic in an in vitro mouse lymphoma (L5178Y) assay and was clastogenic in an in vivo mouse micronucleus assay. Gemcitabine IP doses of 0.5 mg/kg/day (about 1/700 the human dose on a mg/m 2 basis) in male mice had an effect on fertility with moderate to severe hypospermatogenesis, decreased fertility, and decreased implantations. In female mice, fertility was not affected but maternal toxicities were observed at 1.5 mg/kg/day administered intravenously (about 1/200 the human dose on a mg/m 2 basis) and fetotoxicity or embryolethality was observed at 0.25 mg/kg/day administered intravenously (about 1/1300 the human dose on a mg/m 2 basis). The safety and efficacy of Gemcitabine for Injection was studied in a randomized trial of 356 women with advanced ovarian cancer that had relapsed at least 6 months after first-line platinum-based therapy. Patients were randomized to receive either Gemcitabine for Injection 1000 mg/m 2 on Days 1 and 8 of a 21-day cycle and carboplatin AUC 4 administered after Gemcitabine for Injection infusion on Day 1 of each cycle (n=178) or to carboplatin AUC 5 administered on Day 1 of each 21-day cycle (n=178). The primary efficacy outcome measure was progression free survival (PFS). Patient characteristics are shown in Table 11. The addition of Gemcitabine for Injection to carboplatin resulted in statistically significant improvements in PFS and overall response rate as shown in Table 12 and Figure 1. Approximately 75% of patients in each arm received additional chemotherapy for disease progression; 13 of 120 patients in the carboplatin alone arm received Gemcitabine for Injection for treatment of disease progression. There was no significant difference in overall survival between the treatment arms. a 5 patients on Gemcitabine for Injection plus carboplatin arm and 4 patients on carboplatin arm with no baseline Eastern Cooperative Oncology Group (ECOG) performance status. b 2 on Gemcitabine for Injection plus carboplatin arm and 1 on carboplatin arm had platinum-free interval <6 months. e PR plus PRNM = Partial response plus partial response, non-measurable disease. The safety and efficacy of Gemcitabine for Injection were evaluated in a multi-national, randomized, open-label trial conducted in women receiving initial treatment for metastatic breast cancer in women who have received prior adjuvant/neoadjuvant anthracycline chemotherapy unless clinically contraindicated. Patients were randomized to receive Gemcitabine for Injection 1250 mg/m 2 on Days 1 and 8 of a 21-day cycle and paclitaxel 175 mg/m 2 administered prior to Gemcitabine for Injection on Day 1 of each cycle (n=267) or to receive paclitaxel 175 mg/m 2 was administered on Day 1 of each 21-day cycle (n=262). The primary efficacy outcome measure was time to documented disease progression. A total of 529 patients were enrolled; 267 were randomized to Gemcitabine for Injection and paclitaxel and 262 to paclitaxel alone. Demographic and baseline characteristics were similar between treatment arms (see Table 13). Efficacy results are presented in Table 13 and Figure 2. The addition of Gemcitabine for Injection to paclitaxel resulted in statistically significant improvement in time to documented disease progression and overall response rate compared to paclitaxel alone. There was no significant difference in overall survival. b These represent reconciliation of investigator and Independent Review Committee assessments according to a predefined algorithm. A multinational, randomized trial compared Gemcitabine for Injection plus cisplatin to cisplatin alone in the treatment of patients with inoperable Stage IIIA, IIIB, or IV NSCLC who had not received prior chemotherapy. Patients were randomized to receive Gemcitabine for Injection 1000 mg/m 2 on Days 1, 8, and 15 of a 28-day cycle with cisplatin 100 mg/m 2 administered on Day 1 of each cycle or to receive cisplatin 100 mg/m 2 on Day 1 of each 28-day cycle. The primary efficacy outcome measure was overall survival. A total of 522 patients were enrolled at clinical centers in Europe, the US, and Canada. Patient demographics and baseline characteristics (shown in Table 14) were similar between arms with the exception of histologic subtype of NSCLC, with 48% of patients on the cisplatin arm and 37% of patients on the Gemcitabine for Injection plus cisplatin arm having adenocarcinoma. Efficacy results are presented in Table 14 and Figure 3 for overall survival. A randomized (1:1), multicenter trial was conducted in 135 patients with Stage IIIB or IV NSCLC. Patients were randomized to receive Gemcitabine for Injection 1250 mg/m 2 on Days 1 and 8, and cisplatin 100 mg/m 2 on Day 1 of a 21-day cycle or to receive etoposide 100 mg/m 2 intravenously on Days 1, 2, and 3 and cisplatin 100 mg/m 2 on Day 1 of a 21 -day cycle. There was no significant difference in survival between the two treatment arms (Log rank p=0.18, two-sided, see Table 14). The median survival was 8.7 months for the Gemcitabine for Injection plus cisplatin arm versus 7.0 months for the etoposide plus cisplatin arm. Median time to disease progression for the Gemcitabine for Injection plus cisplatin arm was 5.0 months compared to 4.1 months on the etoposide plus cisplatin arm (Log rank p=0.015, two-sided). The objective response rate for the Gemcitabine for Injection plus cisplatin arm was 33% compared to 14% on the etoposide plus cisplatin arm (Fisherâ€™s Exact p=0.01, two-sided). a 28-day schedule â€” Gemcitabine for Injection plus cisplatin: Gemcitabine for Injection 1000 mg/m 2 on Days 1, 8, and 15 and cisplatin 100 mg/m 2 on Day 1 every 28 days; Single-agent cisplatin: cisplatin 100 mg/m 2 on Day 1 every 28 days. b 21-day schedule â€” Gemcitabine for Injection plus cisplatin: Gemcitabine for Injection 1250 mg/m 2 on Days 1 and 8 and cisplatin 100 mg/m 2 on Day 1 every 21 days; Etoposide plus Cisplatin: cisplatin 100 mg/m 2 on Day 1 and intravenous etoposide 100 mg/m 2 on Days 1, 2, and 3 every 21 days. f p-value two-sided Fisher's Exact test for difference in binomial proportions; log rank test for time-to-event analyses. The safety and efficacy of Gemcitabine for Injection was evaluated in two trials, a randomized, single-blind, two-arm, active-controlled trial conducted in patients with locally advanced or metastatic pancreatic cancer who had received no prior chemotherapy and in a single-arm, open-label, multicenter trial conducted in patients with locally advanced or metastatic pancreatic cancer previously treated with 5-FU or a 5-FU-containing regimen. The first trial randomized patients to receive Gemcitabine for Injection 1000 mg/m 2 intravenously over 30 minutes once weekly for 7 weeks followed by a one-week rest, then once weekly dosing for 3 consecutive weeks every 28-days in subsequent cycles (n=63) or to 5-fluorouracil (5-FU) 600 mg/m 2 intravenously over 30 minutes once weekly (n=63). In the second trial, all patients received Gemcitabine for Injection 1000 mg/m 2 intravenously over 30 minutes once weekly for 7 weeks followed by a one-week rest, then once weekly dosing for 3 consecutive weeks every 28-days in subsequent cycles. The patient achieved a â‰¥50% reduction in pain intensity (Memorial Pain Assessment Card) or analgesic consumption, or a 20-point or greater improvement in performance status (Karnofsky Performance Status) for a period of at least 4 consecutive weeks, without showing any sustained worsening in any of the other parameters. Sustained worsening was defined as 4 consecutive weeks with either any increase in pain intensity or analgesic consumption or a 20-point decrease in performance status occurring during the first 12 weeks of therapy. The patient was stable on all of the aforementioned parameters, and showed a marked, sustained weight gain (â‰¥7% increase maintained for â‰¥4 weeks) not due to fluid accumulation. The randomized trial enrolled 126 patients across 17 sites in the US and Canada. The demographic and entry characteristics were similar between the arms (Table 15). The efficacy outcome results are shown in Table 15 and for overall survival in Figure 4. 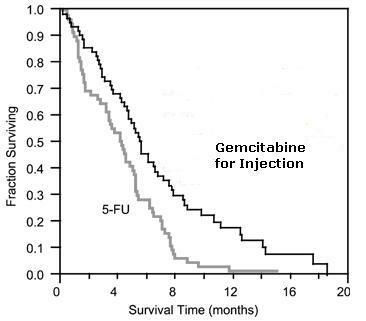 Patients treated with Gemcitabine for Injection had statistically significant increases in clinical benefit response, survival, and time to disease progression compared to those randomized to receive 5-FU. No confirmed objective tumor responses were observed in either treatment arm. b p-value for clinical benefit response calculated using the two-sided test for difference in binomial proportions. All other p-values are calculated using log rank test. 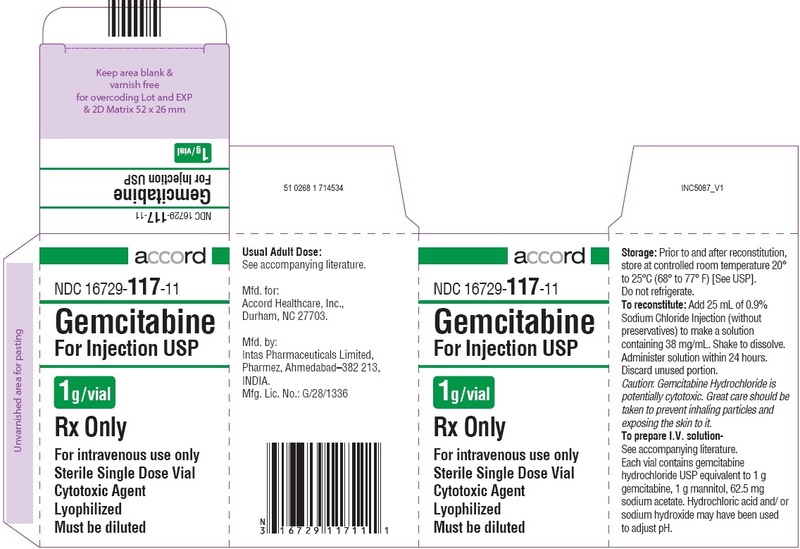 Unopened vials of Gemcitabine for Injection are stable until the expiration date indicated on the package when stored at controlled room temperature 20° to 25°C (68° to 77°F) and that allows for excursions between 15° and 30°C (59° and 86°F) [see USP Controlled Room Temperature] [see Dosage and Administration ( 2.6 and 2.7)] . Advise patients of the risks of low blood cell counts and the potential need for blood transfusions and increased susceptibility to infections. Instruct patients to immediately contact their healthcare provided for development of signs or symptoms of infection, fever, prolonged or unexpected bleeding, bruising, or shortness of breath [see Warnings and Precautions ( 5.2)]. Advise patients of the risks of pulmonary toxicity including respiratory failure and death. Instruct patients to immediately contact their healthcare provider for development of shortness of breath, wheezing, or cough [see Warnings and Precautions ( 5.3)]. Advise patients of the risks of hemolytic-uremic syndrome and associated renal failure. Instruct patients to immediately contact their healthcare provider for changes in the color or volume of urine output or for increased bruising or bleeding [see Warnings and Precautions ( 5.4)]. Advise patients of the risks of hepatic toxicity including liver failure and death. Instruct patients to immediately contact their healthcare provider for signs of jaundice or for pain/tenderness in the right upper abdominal quadrant [see Warnings and Precautions ( 5.5)].